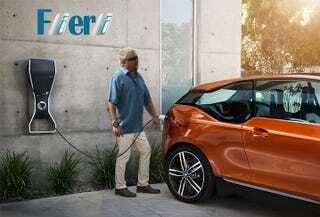 As most of you know BMW launched the new i3, an electric car that comes with a loaner SUV, can be had with half a gas engine and looks like someone drove a next-gen 1Series into a puddle of plastic. If you look close at the front end - there's clearly a small car trapped inside a plastic container filled with batteries. In honor of BMW's new car I started to kick around what kind of creative marketing campaign I'd use to launch the i3. I kept mulling over who would be the right person to launch such an important piece of German machinery. After hearing how much Travis Okulski loved both the i3 and Guy Fieri, I thought - Hmm, He's a smart guy - maybe he's on to something. On second thought, and after looking at the photo above I decided Guy was way too American/Camaro. Has a long established relationship with advanced vehicles. Is well known in America. Then it hit me - David Freaking Hasselhoff! He's German, super famous and is best known for his role as Michael Knight, the man with the talking car - a car from the future. So, here it is - the BMW i3 and Germany's finest, The Hoff. Does it work for you?